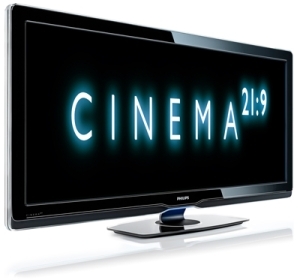 Phillips has introduced a 21:9 aspect ratio TV called the Cinema 21:9. Due to the extra wide aspect ratio, it puts the screen in the same proportion as a real cinema. Other features include Ambilight to make the borders of the screen glow. It is expected that the TV will be shipping in the next few months in several countries across Europe which includes the UK, Germany, Belgium and France. Although it certainly does get our interest here at mobilevenue, it certainly is for the enthusiast or pro as watching DVD or TV aspect ratios would move the borders from the top to the sides of the screen, which could get rather frustrating. The full site for the screen will be launching on January 29 although no pricing details are known just yet… expect expensive rather than cheap. Also, there are no details for a US launch at the moment although we expect the details will fully roll out in the next few weeks. It’s really a 7:3 monitor.